Opis: Spiral galaxies abound in the universe, but spiral sunspots are definitely an unusual twist. 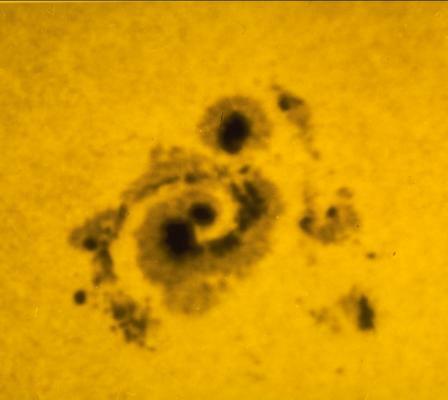 This distinctive spiral-shaped sunspot caught the attention of National Solar Observatory astronomers and was photographed on February 19, 1982 with the Vacuum Solar Telescope on Kitt Peak. Sunspots appear dark only because they are relatively cool - about 4,000 degrees compared to the 6,000 degrees Celsius of the surrounding solar surface. Associated with surface magnetic fields, their numbers increase and decrease in a regular pattern tracing the Solar Activity cycle. A maximum in sunspot numbers occurs every 11 years with the next maximum expected around the year 2001. This sunspot was actually about 50,000 miles across (Earth's diameter is about 8,000 miles) and held its shape for two days.